Production, characterization and inhibition of fungal cellulases utilizing rice bran as substrate in solid state fermentation. Citation: Basak S, Rangan L. Production, characterization and inhibition of fungal cellulases utilizing rice bran as substrate in solid state fermentation. Microbiol Curr Res. 2018;2(4):69-74. Loss of crops to fungal disease is increasing at an alarming rate throughout the world. Growing ecological hazards caused by chemical fungicides necessitate development of alternate pest management strategies in the form of botanical fungicide. Kaempferia angustifolia Rosc. (Zingiberaceae, commonly known as narrow-leaved peacock ginger) is a medicinally important herb with previously reported larvicidal activity. In this study, cellulase was investigated as a target for controlling spread of Fusarium oxysporum (a disease causing fungus in plants) using the aqueous leaf extract of narrow-leaved peacock ginger. Fungal culture of Neurospora crassa and F. oxysporum were used for cellulase production on a substrate of raw lignocellulosic material (rice bran) by solid state fermentation. N. crassa was kept as control. The optimum parameters for cellulase (FPase) production and characterization from the two fungi were found to be: N. crassa (incubation period: 2 d; optimum temperature: 70°C; pH optima: 6.0; optimum substrate: 100 mg of filter paper) and F. oxysporum (incubation period: 1 d; optimum temperature: 60°C; pH optima: 4.0; optimum substrate: 100 mg of filter paper). The study of cellulase inhibition was carried out by two methods: a) incubating the enzyme with serially diluted narrow-leaved peacock ginger leaf extract followed by enzyme assay, and b) incubating the substrate (filter paper) with different concentration of narrow-leaved peacock ginger leaf extract which was followed by addition of enzyme and cellulase assay. Both method of enzyme inhibition showed reduction in fungal cellulolysis. However, by using both methods, the percent reduction in cellulolysis was higher in F. oxysporum. The reduction in cellulolytic activity for F. oxysporum was 87.00% (first method) and 98.13% (second method) which revealed that second method of inhibition was markedly efficient compared to the first method. The decrease in cellulolytic activity for N. crassa of 40% (first method) and 85.45% (second method) was reported in this study. Thus, aqueous extract of narrow-leaved peacock ginger may be used as botanical fungicide to control plant pathogenic fungus (F. oxysporum) through reduced cellulolytic damage of different plant organs. Cellulases are the enzyme complexes composed of endoglucanases, cellobiohydrolases, and β-glucosidases which act synergistically to convert complex carbohydrates present in lignocellulosic biomass into glucose efficiently. These three components have been identified in most cellulolytic systems: Endoglucanase (endo-1,4-β-D-glucan-4-glucanohydrolase, E.C. 3.2.1.4) attacks β-1, 4 bonds randomly within the cellulose chains. Exoglucanase (1,4-β-D-Glucan-cellobiohydrolase, E.C.3.2.1.91) successively removes cellobiose units from free chain ends. β-glucosidase (E.C.3.2.1.21) breaks this cellobiose into glucose units . Cellulolytic enzymes secreted by Fusarium oxysporum, a plant pathogenic fungus, attack the primary and secondary cell wall of the host plant and disintegrate them. The degraded products may get into the transpirational stream, which block the vessels leading to wilt symptoms. The disease collectively named as Fusariosis, affect several crops of economic significance (Cucurbits, sweet potatoes, tomato, tobacco, legumes, and banana) . This fungus can exist as saprophytes; degrade lignin and complex carbohydrates associated with soil debris through exo-cellular cellulases . While substantial research efforts have been directed toward production and characterization of F. oxysporum cellulases [4-7], disproportionately little effort has gone towards the production of cellulases as a target for F. oxysporum mediated Fusariosis. Thus, we speculate that utilization of plant derived extract as cellulolytic inhibitor is one way to develop effective botanical fungicide which will reduce the eco-toxicity shown by chemical fungicides. Without application of fungicide, crop production cannot be imagined. For instance, the estimated current fungicide cost to US farmers is $880 million which tends to increase by 4%-5% every year . Hence, our ecosystem is constantly under threat by indiscriminate application of synthetic fungicides. The carcinogenicity of the chemical fungicides is on the higher side compared to the cumulative use of insecticide and herbicide . Moreover, plant pathogenic fungi are developing resistance to chemical fungicides rendering them ineffective for disease prevention in agricultural system . Thus need for developing botanical fungicide was felt to decrease the dependence of synthetic fungicides which will be biodegradable in nature [11-13]. Plant extracts show antifungal activity against a wide range of fungi [14-16]. But efficacy of Zingiberaceous plants was not tested as a source of potential fungicidal substances through cellulolytic inhibition. Kaempferia angustifolia Rosc. (Family Zingiberaceae; known as narrow-leaved peacock ginger), a pleasant-smelling plant, grows in forests of Assam, Northeast India and also cultivated by the ethnic people for medicinal use. Recently, cytogenetic characterization of this plant was reported by our group . This plant’s leaf is used for treatment of dysentery, stomach pain and common cold, whereas its rhizome extract is used for treatment of cough and also used as a masticatory agent . Various pure compounds (terpene, triterpene, chalcone, glycoside and cyclohexane derivatives) were isolated from narrow-leaved peacock ginger and these isolated compounds have shown larvicidal activity against Aedes aegypti larvae . Apart from this natural mosquito repellents activity, little commercial success was attained for narrow-leaved peacock ginger . In the context of pathogenic fungi in agricultural system, botanical fungicides are best suited for their use in crop and vegetable production for industrialized nations but can play a much bigger role in the production and post-harvest protection of fruits and vegetables in developing countries. Keeping in view with this fact, this study has been designed to check aqueous extract from leaves of narrow-leaved peacock ginger to control F. oxysporum through cellulolytic inhibition. The aim of our work was to produce and characterise Fusarium cellulases by solid state fermentation and to assess the cellulase inhibition potential of aqueous extract of narrow-leaved peacock ginger through in-vitro biochemistry based experiments. N. crassa, a true cellulolytic fungus is capable of synthesizing and secreting cellulase complexes growing on cellulosic sources . Hence N. crassa was kept as control to compare the cellulolytic inhibition obtained by F. oxysporum. Two strains of N. crassa (Fungal genetic stock center (FGSC) 987A and 988A) and one strain of F. oxysporum were used for this study. N. crassa and F. oxysporum strains were obtained on request from Dr. Ranjan Tamuli (Neorospora Laboratory, IIT Guwahati) and Prof. Dhruva Kumar Jha (Department of Botany, Gauhati University), respectively. F. oxysporum were previously collected from the agricultural field of Barpeta District of Assam and was taxonomically identified. Fungal culture of N. crassa was maintained on slants of M2 media at 24°C ± 1°C. Fungal culture of F. oxysporum was maintained on slants of Potato Dextrose Agar (PDA) at 24°C ± 1°C. The microorganisms were sub-cultured once in three weeks. Solid state fermentation (SSF) simulates the natural environment of the fungus for its growth on the plant surface. Thus, cellulase was produced by means of solid state fermentation for further experimentation. Rice bran was obtained from a local rice mill in North Guwahati, Assam. Ten gram of rice bran was placed in 250 mL clean dry conical flasks; 6 mL of sterile water was added to each flask and mixed properly for uniform distribution of moisture throughout the solid substrate. The flasks were then autoclaved at 121°C for 20 mins. The flasks were inoculated with the spores of different fungal strains maintained on media slants. The flasks were incubated at 24°C ± 1°C in a stationary condition for different interval of time (24 h-96 h). At the end of fermentation process, five-fold (w/v) volume of sterile distilled water was added to the flask containing rice bran. The flasks were kept in an orbital shaker at 150 rpm, 28°C for 30 minutes. The content of the flasks were filtered through a cheese cloth and squeezed, the resulting homogenate was centrifuged at 5000 rpm, for 15 min and 4°C to remove fungal cells. The cell free supernatant obtained was used as a crude enzyme sample and analyzed for cellulase activity. Enzyme assays were performed by measuring the amount of reducing sugar liberated from the filter paper by using DNS (dinitrosalicylic acid) method. Concentration of the released glucose was measured from a standard glucose curve. The enzymatic reaction for cellulase was allowed to take place at 50°C  for 60 min using Whatman filter paper-I as substrate. Acetate buffer was used to maintain the pH for the reaction. The FPase (filter paperase) activity was calculated to estimate the cellulase activity. One unit of filter paper activity was defined as the amount of enzyme releasing 1 µmol of reducing sugar from the filter paper per gram dry solid (g-1 DS) per minute. To determine the optimum condition for the study of cellulolytic inhibition, the characterization of the crude enzymes were carried out with respect to temperature, pH and substrate concentration. The influence of temperature on the activity of crude cellulase was studied by exposing the crude enzyme at different temperatures (20°C, 30°C, 40°C, 50°C, 60°C, 70°C, 80°C and 100°C). To determine optimum pH of cellulase, the enzyme assay was carried out using 0.2 M buffers ranging from pH 3-pH 10. Citrate buffer (pH 3.0), acetate buffer (pH 4.0), phosphate buffer (pH 6.0 and pH 8.0) and carbonate buffer (pH 10.0) were prepared for determining the optimum pH for the two enzymes. The effect of substrate concentration on the activity of the crude enzyme was studied by using different amount of Whatman filter paper-I (10 mg-150 mg). Narrow-leaved peacock ginger grow abundantly in Assam. Fresh leaves of narrow-leaved peacock ginger were collected from the green house of Department of Biosciences and Bioengineering, Indian Institute of Technology Guwahati. Leaves were washed and dried. Aqueous extract from the leaf sample was obtained by homogenizing a weighed quantity of leaves to give a concentration of 50 mg.mL-1. The slurry was passed through several thicknesses of cheesecloth and the extract was clarified by centrifugation for 15 min at 3000 rpm. The aqueous supernatant was tested immediately for cellulase inhibition. The inhibition study was performed by two methods . In the first method, the crude plant extract having a concentration of 50 mg mL-1 was serial diluted from 10-1 to10-4 concentrations. Plant leaf extract was tested for inhibition by mixing two parts of enzyme solution with one part of leaf extract; distilled water was used in place of the extract as control. The enzyme was incubated with the leaf extract for 20 min at room temperature which was followed by cellulase assay at the optimized condition for temperature, substrate concentration and pH for each enzyme. The reducing sugar was estimated by DNS method and the reduction in cellulase activity was expressed in percentage loss of cellulase activity with respect to enzyme control. In the second method different aliquots of crude leaf extract (200 μL-1000 μL of concentration 50 mg.mL-1) was added to the substrate (Whatman filter paper-I) initially and incubated at room temperature for 20 mins followed by the addition of buffer and five times diluted enzyme. The cellulase inhibition assay was carried out in the reaction condition optimized in this research. After the enzymatic reaction, the reducing sugar was estimated by DNS method. All experiments were performed in triplicates. The statistical analysis (Mean ± SD) of the triplicates was carried out in Microsoft Excel 2007. Cellulase enzyme activity was determined as the Filter Paper Assay method (FPA) on units per gram dry solid (U g-1 DS) basis. N. crassa 987A showed the highest enzyme activity of 3.830 ± 0.020 U g-1 DS (Mean ± S. E) on day 2 i.e. after 48 h of fermentation. N. crassa 988A showed the highest activity on day 3 of 0.130 ± 0.050 U g-1 DS. Thus, N. crassa 987A was found to exhibit better cellulase activity and chosen as control for further studies on cellulase inhibition by leaf extract of narrow-leaved peacock ginger. F. oxysporum showed maximum enzyme activity of 0.361 ± 0.002 U g-1 DS after one day incubation (Figure 1). Thus, cellulase produced by F. oxysporum after 1 d of fermentation was used for further experiments. Figure 1: Optimization of incubation period for production of cellulase from different microorganisms in solid state fermentation. Values represent mean ± standard error (SE). Effect of pH on enzyme activity and stability: Every enzyme shows a maximum activity at a certain pH. The activity assays for both fungal enzymes were carried out at various pH using different buffers to determine the optimum pH. The variation of enzyme activity with respect to pH was depicted graphically for each fungus. The optimum pH for N. crassa 987A was found to be 6.0 with the highest enzyme activity of 0.290 ± 0.004 U g-1 DS. Thus, phosphate buffer of pH -6.0 was used for any cellulolysis experiment involving N. crassa 987A.The optimum pH for F. oxysporum was found to be 4.0 (acetate buffer) with 0.160 ± 0.002 U g-1 DS cellulolytic activity. For our further experimentation with F. oxysporum, acetate buffer of pH-4 was used (Figure 2a). Figure 2a: Characterization of cellulases at optimum pH. Effect of temperature on enzyme activity and stability: The temperature at which an enzyme attains maximum activity is defined as optimum temperature. The assay of optimum temperature was carried out at the optimum pH of each enzyme: phosphate buffer of pH -6.0 (N. crassa 987A) and acetate buffer of pH -4.0 (F. oxysporum). The graph showed that the optimum temperature of N. crassa 987A was found to be 70°C with cellulolytic activity was of 0.090 ± 0.001 U g-1 DS (Figure 1). In case of F. oxysporum, the optimum temperature of the crude enzyme was found to be 60°C with cellulolytic activity of 0.045 ± 0.001 U/g DS (Figure 2b). Figure 2b: Characterization of cellulases at optimum temperature. Determination of optimum substrate concentration: Enzyme-substrate ratio plays a crucial role in enzyme assay. Cellulase activity was tested for various concentration of the substrate at the optimum pH and optimum temperature of each enzyme: phosphate buffer of pH -6.0 and 70°C (N. crassa 987A); acetate buffer of pH -4.0 and 60°C (F. oxysporum). The optimum substrate concentration for cellulase assay was estimated “100 mg” for both fungal species. Therefore, 100 mg of Whatman filter paper-I was used for the assay. F. oxysporum showed a higher enzyme activity of 0.061 ± 0.001 U g-1 DS compared to N. crassa which showed an activity of 0.044 ± 0.001 U g-1 DS when 100 mg of substrate was taken for the assay (Figure 2c). Figure 2c: Characterization of cellulases at optimum substrate concentration. Inhibition of cellulase activity: The assays of cellulase inhibition were carried out at temperature optima, pH optima and optimum substrate concentration of each enzyme by two methods: 70°C, pH 6.0, 100 mg of filter paper (N. crassa 987A) and 60°C, pH 4.0. 100 mg of filter paper (F. oxysporum). In the first method, a decrease of ~43% cellulolytic activity (N. crassa) was observed with 5 mg.mL-1 narrow-leaved peacock ginger leaf extract. The effect of inhibition was reduced as the extract was diluted further. When the extract was diluted 10-4 times, the reduction in fungal cellulolysis was just about 7% (N. crassa). A reduction of about 87% cellulolytic activity (F. oxysporum) was observed with K. angustifolia leaf extract of 5 mg.mL-1 concentration. When 10-4 times serially diluted narrow-leaved peacock ginger leaf extract was used, cellulolytic activity reduced to 27% (Figure 3a). 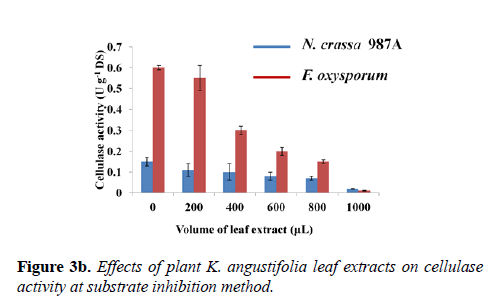 Figure 3a: Effects of plant K. angustifolia leaf extracts on cellulase activity at enzyme inhibition method. From this analysis, it was evident that cellulase of F. oxysporum was markedly affected by narrow-leaved peacock ginger as compared to N. crassa. A comparative study on the effect of varying leaf extract concentration on the cellulase enzyme activity of both N. crassa and F. oxysporum was graphically demonstrated in the second method (Figure 3b). The controls were devoid of the leaf extract which showed maximum cellulase activity of the crude enzyme of both species. The enzyme activity of controls from N. crassa was 0.150 ± 0.020 U g-1 DS and from F. oxysporum was 0.59 ± 0.010 U g-1 DS. As the concentration of the leaf extract was increased, reduction of cellulase activity was observed. 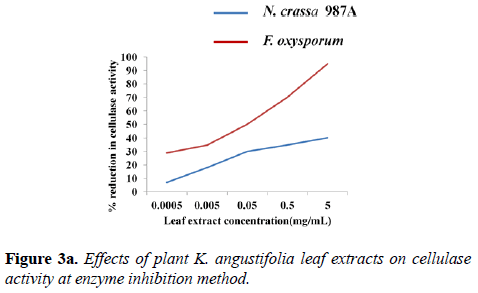 The cellulase activity reduced to 85.45% in N. crassa and 98.13% in F. oxysporum when 1 mL (5 mg mL-1) of the plant extract was incubated with the substrate followed by the assay (Figure 3b). Figure 3b: Effects of plant K. angustifolia leaf extracts on cellulase activity at substrate inhibition method. From these two methods, the second method was proven to be effective in controlling F. oxysporum mediated cellulolysis. In this study, we have reported the production, characterization and inhibition of fungal cellulase. Exocellulase production by F. oxysporum was found to be maximum after 1 d of fermentation on wheat bran based solid substrate whereas maximum cellulolytic activity of N. crassa was attained after 2 d of fermentation. Previous report of F. oxysporum based fermentation in submerged fermentation reported highest cellulase activity after 12 d . N. crassa was shown previously to produce cellulases after 2 d of submerged fermentation . Our study revealed that pH optima of cellulases from F. oxysporum were 4.0 which are acidic in nature whereas the laboratory stain N. crassa had a neutral pH (6.0). Previous research involving attack of pathogenic bacteria, fungi and pest on plants showed that cellulases from these organisms have acidic pH ranges. The optimal temperature for the cellulase activity of N. crassa and F. oxysporum were 70°C and 60°C, respectively. Temperature optima of N. crassa ranged between 45°C-65°C, with the stability optimum between 45°C and 50°C  whereas temperature optima for F. oxysporum were previously reported to be 50°C . Thus, our study revealed that higher thermo stability of the microorganisms which may be explored industrially to develop novel botanical fungicide. Our study also revealed 100 mg of filter paper was optimum for cellulase production by both microorganisms whereas 50 mg filter paper was used for cellulase production by F. oxysporum in previous study . This result showed that cellulase optimized in our study possess a broad substrate saturation kinetics compared to earlier reports which may draw industrial attention for development of effective botanical fungicide. Being the experiment of cellulase inhibition was carried out at the temperature optima of each enzyme, difference in the percent of inhibition achieved by using two methods can be compared. Because, the difference in percentage of inhibition achieved in each method was due to the difference in the method of inhibition. Moreover, it also revealed that second method of inhibition (substrate inhibition) was proven much effective compared to the first method (enzyme inhibition). In the first method, the enzyme was first blocked with the plant extract which reduces the activity of the enzyme by blocking the active sites present in cellulases. In the second method of enzyme inhibition, the substrate (filter paper) was initially incubated with the plant extract which might have done conformational damage of the cellulosic residues. Then the un-inhibited enzyme digested the filter paper-plant extract complex easily which showed the effectiveness of the second method of inhibition. In nature, the second model of inhibition is predominant. For example, narrow-leaved peacock ginger extract derived molecules will be interacting with the cellulosic residues of the host plants (in the form of spraying on the seed surface or soaking the seeds in the aqueous narrow-leaved peacock ginger extract) and later the F. oxysporum derived cellulases will come into action. Restricted fiber fermentation was observed in the rumen of animals which eat leaves of alfalfa (Medicago satiua L.) hay, smooth bromegrass (Bromus inermus Leyss.) hay and maize (Zea mays L.). This may be due to the presence of phenolics-carbohydrate in the leaves causing inhibition of cellulolysis of rumen micobiome . The flavonoid isolated from plants could be used as natural potential insecticide as they could bind the substrate binding site of the insect pest cellulases (red pumpkin beetle). The characterization and inhibition of a cellulase enzyme (endo-1, 4-beta-D-glucanase), was an example of repellency of insect pest by a plant derived flavonoid compound through inhibition of cellulases activity [25-27]. Pathogenic fungi follow specific mechanisms to attack their host plants. This is usually achieved by synthesis of a set of polymer degrading enzymes such as exo-cellular cellulases. The cell wall degrading cellulase enables the fungus to establish a host-pathogen relationship. Although phenolic compounds act as natural defense compounds in plants, phenolic compounds were reported as the pectinase inhibitors against F. oxysporum and F. moniliforme but not in the case of F. oxysporum. But volatile rhizome oil of Zingiber officinale (ginger) exhibited high inhibitory effect on the fungal growth. The culture filtrate of Trichoderma viride was reported as the one of biocontrol agent of Fusarium wilt disease caused by F. oxysporum . Kaempfolienol, crotepoxide, boesenboxide, zeylenol, 2′-hydroxy-4, 4′, 6′-trimethoxychalcone, (24S)-24-methyl-5α-lanosta-9, 25-dien-3β-ol, β-sitosterol and β-sitosterol-3-O-β-D-glucopyranoside were isolated previously from narrow-leaved peacock ginger . The role of these compounds as cellulolytic inhibitor was not studied before. Previous research has not found any correlation of fungal growth with enzyme inhibition. Although growth retardation assay of F. oxysporum was not performed, the present results are in conformity with other studies, which screened Z. officinale to be the most potent plant extract against F. oxysporum . We investigated cellulase production and its inhibition in F. oxysporum. As the initial step in the work, optimal condition was determined by producing the enzyme in solid state fermentation. The maximum cellulase activity produced by F. oxysporum and N. crassa 987A utilizing rice bran as substrate was found to be 3.830 ± 0.020 U g-1 DS (two days of fermentation) and 0.361 ± 0.002 U g-1 DS (one day of fermentation), respectively. The enzyme of N. crassa 987A has a pH optima of 6.0 and temperature optima of 70°C. The enzyme F. oxysporum has pH optima of 4.0 and temperature optima of 60°C. The optimum substrate amount was found to be 100 mg of Whatman filter paper 1 for both strains. This work has given a base of utilizing the aqueous extract of leaves of narrow-leaved peacock ginger for the control of wilt disease caused by F. oxysporum through inhibition of cellulase activity. Under the optimal condition, cellulase produced by two strains (F. oxysporum and N. crassa) was inhibited by the aqueous extract of narrow-leaved peacock ginger. It was found that the inhibition attained by F. oxysporum was much higher compared to the laboratory stain N. crassa. Moreover substrate inhibition was found to possess better inhibitory potential of cellulolysis compared to enzyme inhibition. In future, the isolation of the active compound from the aqueous extract of narrow-leaved peacock ginger against cellulolytic inhibition will be required. SB thanks Ministry of Human Resources Development (MHRD), Government of India for fellowship. LR thanks DBT Twinning Programme for NE (BT/33/NE/TBP/2010) and Department of Biotechnology, IIT Guwahati for providing all necessary infra-structural support. Bhat MK. Cellulases and related enzymes in biotechnology. Biotechnol Adv. 2000;18:355-83. Rehman MF, Tariq ML, Aslam M, et al. Inhibition studies of cellulolytic activities isolated from Planococcus citri. Open Enzyme J. 2009;2:8-11. Agrios GN. Plant Pathology, 3rd Ed Academic Press. 1988. Ramanathan G, Banupriya S, Abirami D. Production and optimization of cellulase from Fusarium oxysporum by submerged fermentation. J Sci Ind Res. 2010;69:454-9. Li QM, Shi Z, Xiong XY, et al. Ethanol production from xylose by Fusarium oxysporum and the optimization of culture conditions. 2016;34:110-8. Becker OS. Production of Cellulases by the Endophytic Fungus Fusarium oxysporum. J Microbiol Res. 2013;3:131-4. Panagiotou G, Kekos D, Macris BJ, et al. Production of cellulolytic and xylanolytic enzymes by Fusarium oxysporum grown on corn stover in solid state fermentation. Ind Crop Prod 2003;18:37-45. Gianessi LP, Reigner N. The value of fungicides in U.S. crop production. 2005. Siva N, Ganesan S, Banumathy N, et al. Antifungal effect of leaf extract of some medicinal plants against Fusarium oxysporum causing wilt disease of Solanum melogena L. Ethnobot Leafl 2008;12:156-63. Zhonghua M, Michailides TJ. Advances in understanding molecular mechanisms of fungicide resistance and molecular detection of resistant genotypes in phytopathogenic fungi. Crop Prot 2005;24:853-63. Xan TD, Yuichi O, Junko C, et al. Kava root (Piper methysticum L.) as a potential natural herbicide and fungicide. Crop Prot. 2003;22:873-81. Islam MR, Hossain MK, Bahar MH, et al. Identification of the causal agent of leaf spot of betelnut an in vitro evaluation of fungicides and plant extracts against it. Pak J Biol Sci. 2004;7:1758-61. Shirurkar DD, Wahegaonka NK. Antifungal activity of selected plant derived oils and some fungicides against seed borne fungi of maize. European J Exp Biol. 2012;2:1693-6. Dellavalle PD, Cabrera A, Alem D, et al. Antifungal activity of medicinal plant extracts against phytopathogenic fungus Alternaria Spp. Chilean J Agric Res. 2011;71:231-9. Neela FA, Sonia IA, Shamsi S. Antifungal activity of selected medicinal plant extract on Fusarium oxysporum Schlechtthe causal agent of Fusarium wilt disease in tomato. Am J Plant Sci. 2014;5:2665-71. Sales MDC, Costa HB, Fernandes PMB, et al. Antifungal activity of plant extracts with potential to control plant pathogens in pineapple. Asian Pacific J Tropical Biomed. 2016;6:26-31. Basak S, Krishnamurthy H, Rangan L. Genome size variation among 3 selected genera of Zingiberoideae. 2018;15:42-9. Sukari MA, Rashid NY, Neoh BK, et al. Larvicidal activity of some Curcuma and Kaempferia rhizome extracts against dengue fever mosquito Aedes aegypti Linnaeus (Diptera: Culidae). Asian J Chem. 2010;22:7915-9. Isman MB. Botanical insecticides, deterrents, and repellents in modern agriculture and an increasingly regulated world. Ann Rev Entomol. 2006;51:45-66. Yazdi MT, Woodward JR, Radford A. The cellulase complex of Neurospora crassa: activity, stability and release. J Gen. Microbiol. 1990;136:1313-9. Ghose TK. Measurement of cellulase activities. Pure App Chem. 1987;59:257-68. Fawzl EM, Khalil AA, Afifi AF. Antifungal effect of some plant extracts on Alternaria alternata and Fusarium oxysporum. African J Biotechnol. 2009;8:2590-7. Rao M, Deshpande V, Keskar S, et al. Cellulase and ethanol production from cellulose by Neurospora crassa. Enzyme Microb Technol. 1983;5:133-6. Jung HG. Inhibitory potential of phenolic-carbohydrate complexes released during nuninal fermentation. J Agric Food Chem.1988;36:782-8. Sami AJ, Shakoori AR. Biochemical characterization of endo-1, 4-β-D-glucanase activity of a green insect pest Aulacophora foveicollis (Lucas). Life Science J. 2008;5:30-6. Rajeswari P. Inhibition of pectinolytic and cellulolytic enzymes of Fusarium oxysporum by Trichoderma spp and Pseudomonas fluoroscens on Arachis hypogaea. L. Int J Agric Innovations Res. 2014;3:817-22. Tang SW, Sukari MA, Neoh BK, et al. GCL Phytochemicals from Kaempferia angustifolia Rosc. and Their Cytotoxic and Antimicrobial Activities. Molecules. 2011;16:3018-28.